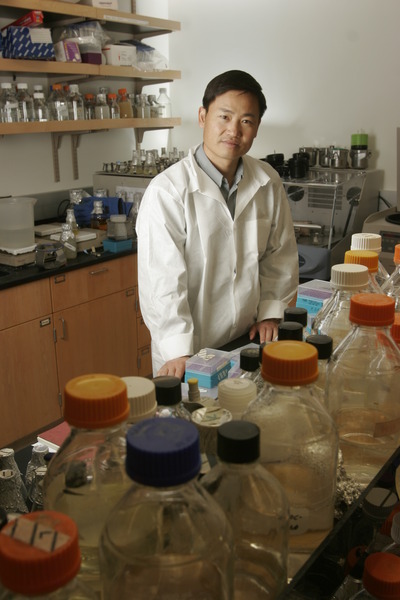 RIVERSIDE, Calif. – Jian-Kang Zhu, an internationally renowned plant cell biologist at the University of California, Riverside, has been elected a member of the National Academy of Sciences (NAS) for his excellence in original scientific research. Membership in the NAS is one of the highest honors given to a scientist or engineer in the United States. 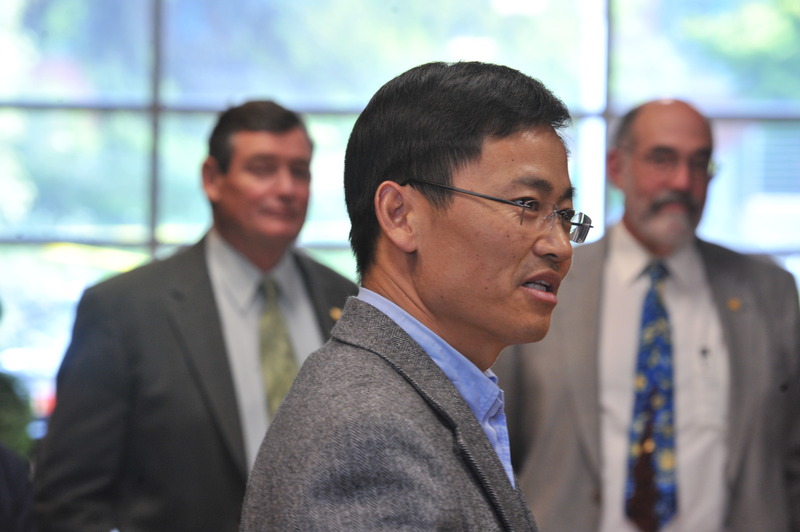 Zhu will be inducted into the academy next April during its 148th annual meeting in Washington, D.C.
Zhu, elected along with 71 others, brings the number of current UCR faculty elected to NAS to five. Four additional UCR faculty members who received the honor are deceased; one faculty member who received the honor when he was at UCR is now at UC Irvine. There are currently just over 2,000 active NAS members. Among the NAS’s renowned members are Albert Einstein, Robert Oppenheimer, Thomas Edison, Orville Wright, and Alexander Graham Bell. More than 180 living NAS members have won Nobel Prizes. One of the most important distinguishing features of plants is that they are sessile and thus have to endure environmental challenges. Zhu, a professor of plant cell biology, focuses on researching the molecular genetic mechanisms underlying plant responses to adverse environments such as salinity, drought and low temperature. His work has led to the identification of genes for modifying the responses of crops to environmental stresses, which will ultimately lead to major contributions to agriculture and the environment. Zhu and his colleagues have used the model plant Arabidopsis to create mutants that are “salt overly sensitive” (SOS). By cloning and characterizing the SOS genes, they have been able to describe a signaling pathway that mediates the response of Arabidopsis to high salinity. Zhu has also played a leading role in the genetic analysis of how plants respond to low temperature (cold) stress and has already discovered several novel regulators of cold-responsive genes important in chilling and freezing tolerance. Recently, the Zhu lab has focused on the mechanisms of transcriptional gene silencing and the role of epigenetic gene regulation in stress adaptation. The Zhu lab uses a combination of genetic, biochemical, genomic and proteomic approaches to analyze various levels of gene regulation (chromatin level/epigenetic, transcriptional, posttranscriptional, and protein activity) and to understand stress signaling and stress tolerance. Zhu received his B.S in 1987 from Beijing Agricultural University. He is an alumnus of UCR, from where he earned his master’s degree in 1990. He received his doctoral degree from Purdue University in 1993. He is a fellow of the American Association for the Advancement of Science and a member of the American Society of Plant Biologists. His many honors and awards include being the most-cited plant scientist in the United States during 1997-2007, as reported by Thomson Reuters in 2008. He received the Charles Albert Shull Award from the American Society of Plant Biologists in 2003 and the Distinguished Agricultural Alumni Award at Purdue University in 2005. Currently, Zhu has an appointment also at the King Abdullah University of Science and Technology, Saudi Arabia, where he is the director of the Plant Stress Genomic and Technology Research Center and a Named Professor of Molecular Biology and Plant Physiology. Jian-Kang Zhu is a professor of plant cell biology at UC Riverside. Photo credit: UCR Strategic Communications. Jian-Kang Zhu speaks at a reception held in his honor at UC Riverside, April 27, 2010. Photo credit: UCR Strategic Communications. 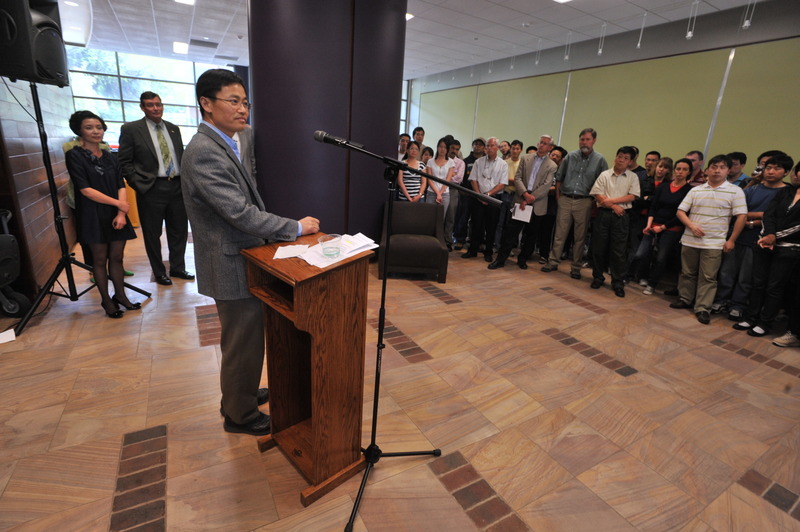 Jian-Kang Zhu speaks at a reception held in his honor at UC Riverside, April 27, 2010. 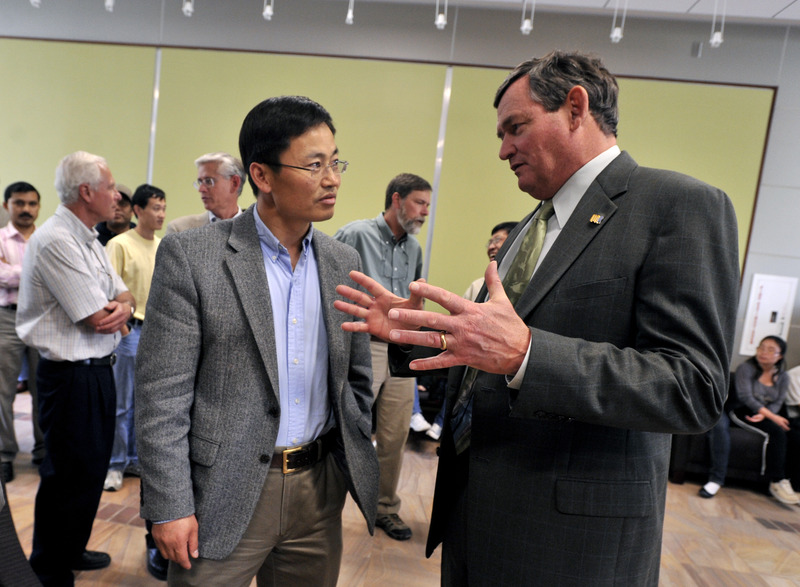 In the background are Chancellor Timothy White (left) and Dean Thomas Baldwin (right). Photo credit: UCR Strategic Communications.